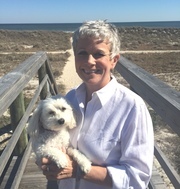 Sherri Rinker has recently joined our team at Amelia Coastal Realty. She brings 16 years of real estate experience and is currently licensed in Florida and Georgia. Her background includes sales in Residential, Commercial, large land tracts and development property. The past two years allowed her to travel across the US selling property for a large land development company. Now she is staying close to home and looks forward to helping clients complete seamless real estate transactions whether it is selling a property or assisting in finding just the right property to purchase! Sherri graduated from Georgia Southern University with a major in Business Management. She moved from Cordele Georgia in October of 2013 and knew that Amelia Island would be her new Home! Her son, Bryan Bush, lives in Cordele. Her four legged “Office Assistant” is Maggie and she loves meeting new friends every day!! Please give Sherri a call with any of your Real Estate needs!